With over 30 years of combined experience with Microsoft collaboration and productivity tools, PowerApps911 is committed to providing full service solutions for customers based on SharePoint, Power BI, PowerApps, Flow and Azure. Using these tools, PowerApps911 is dedicated to helping organizations improve operations through streamlined online processes and getting the most out of their Microsoft investment. 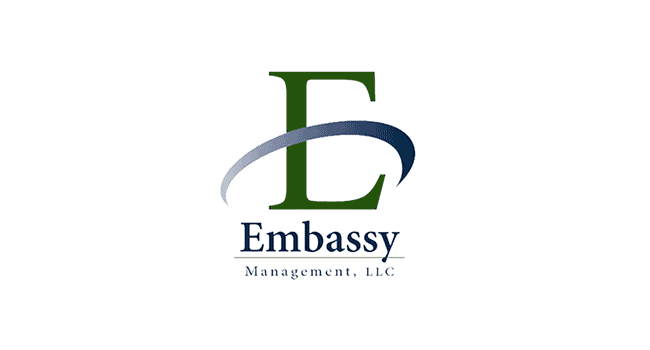 Embassy Management, LLC operates in multiple states, and provides quality business services such as accounting, payroll, information technology, human resources, and more. They are responsible for the overall supervision, management, and strategic planning for their family of companies and over 5,000 employees. Embassy Management, LLC was developed out of a need to provide high quality management services for the Aacre group of companies in 2007. PowerApps911 created a business application with Microsoft PowerApps and Office 365 for Embassy Management, LLC that enabled a new level of customer service, by simplifying the arduous task of scheduling and tracking client meetings. Employees across the various organizations within Embassy Management had a need to log, track and update appointments for all of their clients. With the companies spanning numerous geographical territories, accurately scheduling, updating and tracking appointments with clients was time consuming, and with so many moving parts was prone to human error. PowerApps911 was engaged to build a business application for Embassy Management that would simplify this process and improve the information that was tracked and captured about the meetings. Utilizing Microsoft PowerApps and Office 365, the application makes it possible to add and manage clients on the system, and assists employees with logging, tracking, and updating appointments for all their clients. The app is built using Azure SQL database as the main data source but there are also connections to SharePoint Online and Microsoft Flow. Through these connections managers can add clients to SharePoint and trigger workflows with Flow that update the App, giving the employee everything they need to work with the client. The app uses multiple tables within the Azure SQL database. Information is pulled from several tables and displayed on a single screen. Once the users view and or update records, the information is patched back to SQL. Users create appointments, notes, or new meetings and can input their data in a single location, where it will be available for action, or the next time they meet with the client. When creating new meetings or appointments, there is a location field which connects to google maps API, allowing the users’ location to be pulled, viewed, and stored with the click of a button. These types of usability features improve the user experience, and the customer experience, and save valuable time and effort while increasing accuracy and recollection. And an additional app for managers, gives the functionality and capabilities they need to effectively manage their teams. Employees throughout Embassy Management LLC can now easily track their appointments, while managers now have the ability to create new clients and update the database as needed. By managing all this information centrally within Office 365, and having common processes for tracking meetings, accuracy is improved, and the whole process is much easier and more efficient for employees and their managers.